You can edit multiple movies in one go by using the Edit Multiple screen. !Edit Multiple is the only feature in Movie Collector that overwrites existing data. Use it with great care. Make sure that the movies you want to edit are listed in the “list panel”. Click menu View > List View to switch to List View. 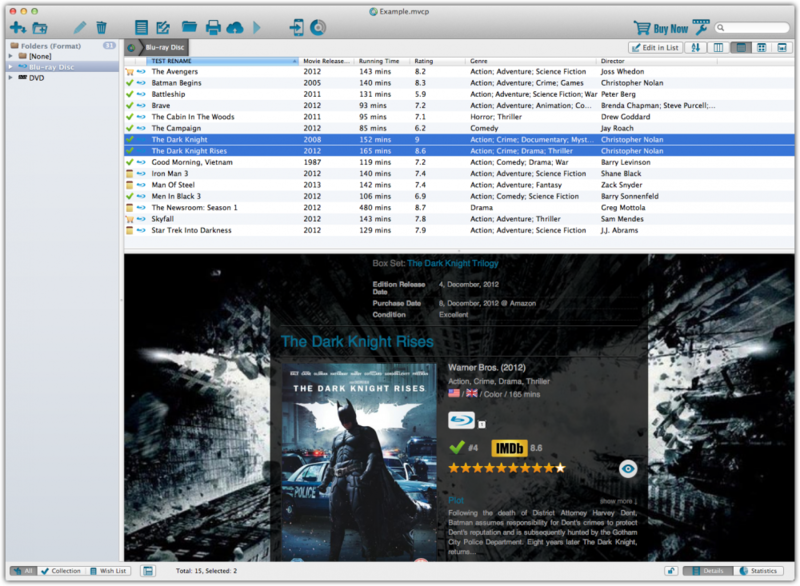 * Choose View > Folders > No Folders to have all your movies show up in the Main List. Now select the movies you want to edit. You can use the standard Ctrl+click (or Command+click if you’re on a Mac) and Shift+click to select multiple movies. Click menu Edit > Edit Multiple Movies. All values you enter here will be applied to all selected movies. If you leave a box empty, that field will be left untouched for all selected movies. When you’re done making changes, click OK.
*You can clear a value for all movies in your selection by putting your cursor in the field and then pressing F8 on your keyboard. Use the Next or Previous button to edit the next or previous movie in your collection.